This IC is almost the same as TDA2030, only it doesn't need the protective clamping diodes on the output. It behaves almost like general op-amps. I had a trouble with oscillations when I built this amp, which was caused by wrong PCB design. In my later designs it didn't occur anymore. This amp is fast, at least it's faster than TDA2030, and it's got one decimal order lower THD. 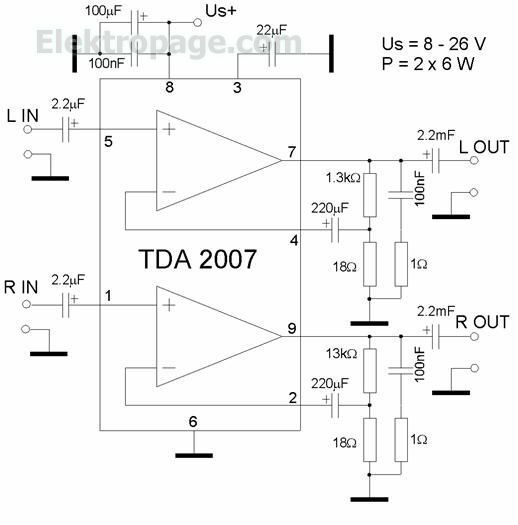 There is a similar IC on the market, also by SGS-Thomson, called TDA2050, which should be identical to the TDA2040 except for higher power.